Originally used for retaining slopes, rock gabion walls have been cropping up everywhere from garden walls, planters and benches, to the walls of outdoor rooms. Rough and industrial in the best ways, these walls can add a major dose of textural interest to landscapes and — depending on what’s used to fill them — can help keep rocks and leftover construction materials out of landfills. Take a look at these 8 elegant ideas for incorporating a gabion wall into your landscape. 1. Tiered planting. 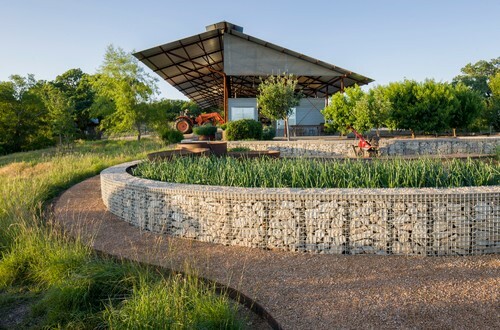 Functioning both as retaining walls for the gentle slope and as an architectural feature of the landscape, these gabion walls in Central Texas hit it just right for a contemporary farm look. 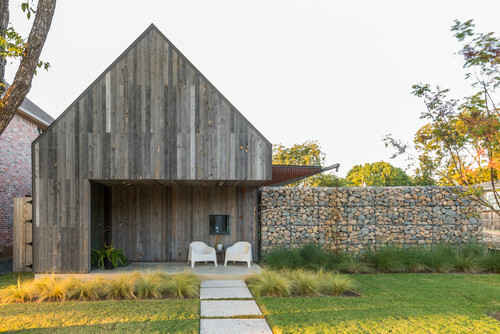 The curve of the gabion walls bordering both an upper orchard and lower veggie patch emphasize the subtle grade change of the property, while the gray stones filling the walls tie in visually with the metal of the barn. 2. Textural accent. To get a hint of rock gabion texture without an expansive wall, take a look at this planter idea from a Seattle garden. 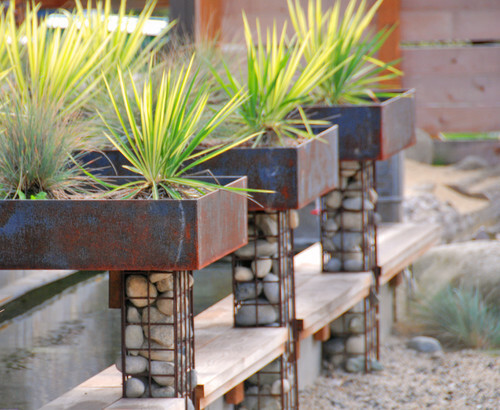 The designer used rock gabions as columns for a series of metal rill planters. The design detail works particularly well as a material transition from the Cor-Ten steel planters to the gravel below, with the rock gabion as an in-between that blends both metal and stone. 3. Modern bench seating.Tucking rock cages underneath benches is another great way to add texture without going all-in on a large gabion wall feature. 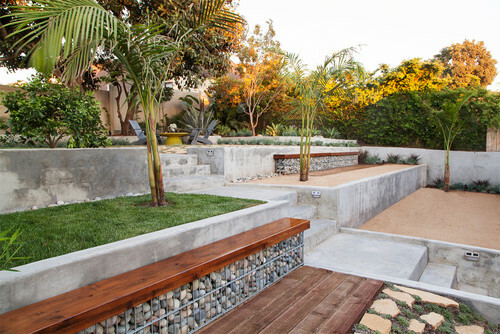 In this Los Angeles backyard, the designer used metal cages filled with chunky river rocks and topped with polished wood to form two long bench seats right up against the retaining walls. 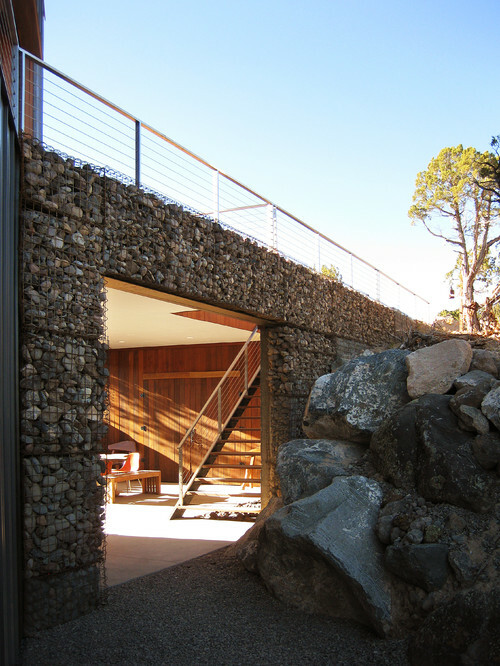 The gabions (and the same river rocks placed along the walls nearby) add textural contrast in what would otherwise be a landscape of many smooth surfaces, including concrete and decomposed granite. 4. Subtle color play. The gabion wall in the front yard of this home in East Dallas elegantly ties together the color palette of the building and landscape. The mix of gray and warm-beige stones echoes the weathered gray wood siding, concrete pad and golden tones of the grasses. The metal cage that holds the gabion wall together also ties in with the metal accents of the home, including the skinny metal house numbers and a metal-rimmed pop-out window, as well as the metal barn-style roof. Note: Gabion walls are easier to climb than smooth stone walls or other forms of perimeter fencing. If security is a concern in your neighborhood, or your county has regulations against fences or walls that can be climbed, a gabion may not be the right choice for a perimeter wall. 5. Integrated with nature. The gabion walls along the exterior of this mountain retreat outside of Salt Lake City give the impression that the structure literally rises from the hillside. The gabion walls — used as a facing in front of solid walls — were filled with stones gathered from the property mixed with gravel sourced nearby. The stones also help regulate the building’s temperature, absorbing heat from the sun during the day and keeping the interior cool while radiating stored heat at night. 6. Art backdrop. Another shot of the Utah property shows what a rich backdrop the gabion wall creates for exterior art. 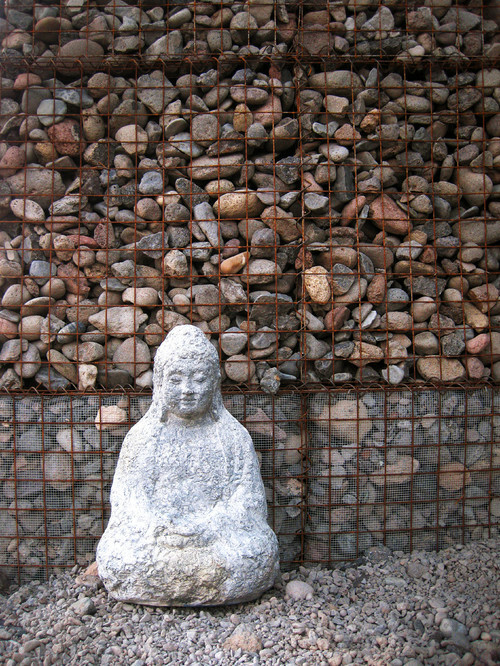 Given a gabion wall’s complex texture, it’s best to combine it with sculptures that will stand out against the stones rather than compete with them. This sitting Buddha works particularly well, as it’s light-colored and relatively smooth — both factors help it stand out from the medium-dark rocks behind. 7. Indoor-outdoor accent wall. Just as a wall of exposed brick can really make a room inside the house, a texture-rich gabion wall can take the design of an outdoor room up a notch as well. The architect of this Las Vegas property used a large-scale gabion wall filled with caramel-colored stones to separate two outdoor living areas. The first, pictured here, is of a lower lounge, where the gabion wall functions as a warm accent wall behind a hearth, completely changing the feeling of what might otherwise be a dark under-stair area. The wall’s other side borders a second outdoor living space with a daybed, adding a rich textural element to the space. 8. Retaining wall. The original use of gabion walls — to retain slopes — remains highly effective in landscapes. 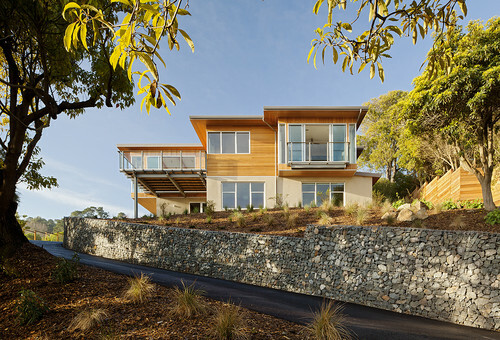 For this sloped property in Tiburon, in Northern California, the landscape architects used a large gabion as a retaining wall for the curved driveway. The stone’s texture and natural color variation add far more interest to the entrance than a retaining wall made of concrete. The wall could be softened further by tucking succulents or other low-water plants into the crevices between the stones. In the backyard of the same property, the landscape architects used a second gabion wall to retain the backyard slope and establish a level terrace for a patio and no-mow lawn.